The Nuremberg Code has served as a foundation for ethical clinical research since its publication 60 years ago. This landmark document, developed in response to the horrors of human experimentation done by Nazi physicians and investigators, focused crucial attention on the fundamental rights of research participants and on the responsibilities of investigators. It was prepared at a very momentous occasion, following the formal surrender of Germany at the end of the Second World War. The Allied Commanders were well aware of the atrocities committed by the German Forces, on civilians and prisoners of war, and prosecuted the leading German authorities. Popularly known as the Nuremberg Trials, these were a series of military tribunals, held by the victorious Allied forces, wherein prominent members of the political, military, and economic leadership of the defeated Nazi Germany were prosecuted. The trials were held in the city of Nuremberg, Bavaria, Germany, in 1945-1946, at the Palace of Justice. The second set of trials of lesser war criminals was conducted under Control Council Law No. 10 at the US Nuremberg Military Tribunals; among them was included the Doctors' Trial which is most relevant to the Nuremberg Code. The judges in this case were Walter B. Beals (presiding judge) from Washington, Harold L. Sebring from Florida, and Johnson T. Crawford from Oklahoma, with Victor C. Swearingen, a former special assistant to the Attorney General of the United States, as an alternate judge. The Chief of Counsel for the Prosecution was Brig Gen Telford Taylor and the chief prosecutor James M. McHaney. The indictment was filed on October 25, 1946; the trial lasted from December 9 that year until August 20, 1947. Of the 23 defendants, 20 were doctors, while 3 were administrators. The accused were indicted on four counts viz. Interestingly, there was one woman among them and she was Herta Oberheuser, who was convicted to 20 years in prison (later reduced to 10 years on appeal), on count II and III. In his opening statement for prosecution,  Brig Gen Telford Taylor described the medical set up in Germany and the affiliation of defendants to the different arms and services. He then went on to relate the counts on which each of the defendants was indicted and finally spoke of violation of Medical ethics. Taylor stated that the 20 physician defendants had violated the Hippocratic Oath including its fundamental principle "Primum non nochere." Taylor said that on November 24, 1933, the Nazis passed a law to protect animals from being cruelly treated, and that animals should be used judiciously, only when necessary and finally put to death painlessly after the completion of the experiment. He alleged that defendants behaved with less humanity toward fellow humans than was demanded by the animal protection law. The charge against the 20 defendants was that they had violated the Hippocratic Oath and behaved in a manner incompatible with their education and profession. The defendants were charged with war crimes and crimes against humanity. The prosecution's case rested upon what was considered ethical in general by the medical profession and the world, though no specific code for medical research existed (as per the prosecutors). What is strange is that nowhere in his opening statement did Brig General Taylor or the Chief Prosecuting attorney (James M. McHaney) refer to the 1931 Guidelines for Human Experimentation passed by German Government. These guidelines for therapeutic and scientific research on human subjects were published originally as a Circular of the Reich Minister of the Interior dated February 28, 1931. The guidelines remained in force until 1948, but for unknown reasons, they were not included in the Omnibus Law (Ueberleitungsgesetz) passed by the Bundestag after 1948, which transported hundreds of laws and regulations of the Reich into the Federal Republic's legal structure. 5. Innovative therapy may be carried out only after the subject or his legal representative has unambiguously consented to the procedure in the light of relevant information provided in advance. Where consent is refused, innovative therapy may be initiated only if it constitutes an urgent procedure to preserve life or prevent serious damage to health and prior consent could not be obtained under the circumstances. 6. The question of whether to use innovative therapy must be examined with particular care where the subject is a child or a person under 18 years of age. 10. A report shall be made in respect of any innovative therapy, indicating the purpose of the procedure, the justification for it, and the manner in which it is carried out. In particular, the report shall include a statement that the subject or, where appropriate, his legal representative has been provided in advance with relevant information and has given his consent. Where therapy has been carried out without consent, under the conditions referred to in the second Paragraph of Section 5, the statement shall give full details of these conditions. Andrew Ivy, the American physiologist who assisted the court at the Doctor's trial and suggested at least three points for the Nuremberg Code, claimed during cross examination that there were no written principles of research in the United States or elsewhere before December 1946. This statement, at best, was misrepresentation of facts and at worst an act of perjury. It is acknowledged world wide that the Code does not have the force of law behind it. Each principle enunciated in this code has been widely acclaimed and explained but the deficiencies in the code have not been commented upon. There are some glaring errors, some wrong usage of language which need to be understood, in order to appreciate why this document, so revered and respected, fails to fulfill any purpose at all. Additionally, the Nuremberg Code is a document which has copied ideas from the 1931 guidelines, and since it has been done without acknowledging the source, is guilty of plagiarism. 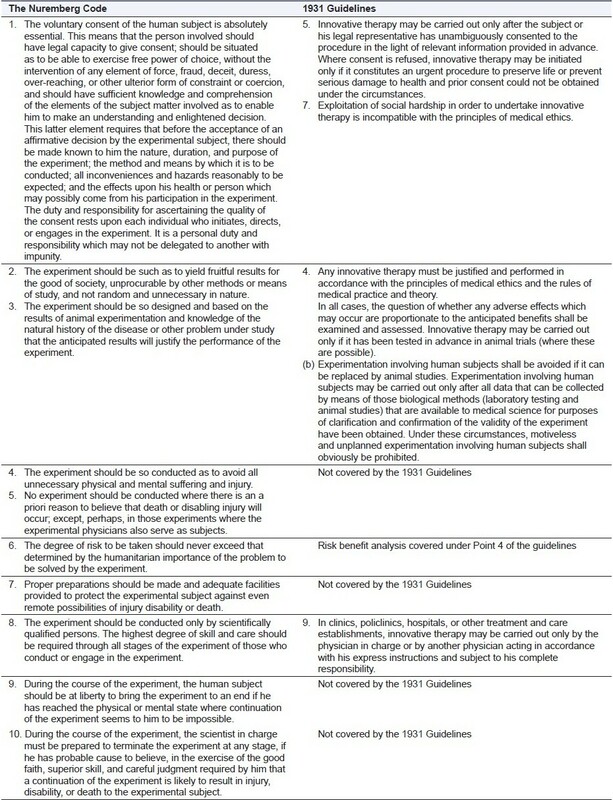 A point-by-point comparison of the code with the guidelines shows that the code was based on 1931 guidelines, and often the guidelines were not interpreted correctly [Table 1]. The 1931 Guidelines cover the Principles No. 4, 5, 9, and 10, but not in so many words. If the guideline is to be followed in spirit and not in word, a new code would be redundant. It should also be recalled that the 1931 guidelines predate the Code by a good 16 years, and these were very momentous years for the world. The medical world changed beyond recognition during this period, a reflection of which is seen in the code. So, also, the 1931 guidelines were in German, and translation may have taken away some of the bite that they had. None the less, it is interesting to read the principles introduced in the Nuremberg Code, over and above what existed in the 1931 guidelines and analyze them. Article 4. This is absolutely essential and there is no ambiguity in the language used. Article 5. This article seems to suggest that studies that are endangering the life of subjects are permissible, if the investigator also takes is a subject. This runs against natural justice, just because the investigator is ready to risk his own life, he has no right to endanger another person's life. By this token, a drunken pilot should be allowed to fly, since his own life is at jeopardy along with that of his passengers. Article 9. This article is absolutely essential and noncontroversial. Article 10. In principle, this article is essential, but its language is faulty. The investigator is not required to terminate the trial, but should be merely prepared to do so, if he/she thinks there is risk of death or serious injury to the subject. The difference between being required to stop and ready to stop has been lost on the authors of the document. The Nuremberg Code introduced four principles which were not directly covered by the 1931 guidelines. Two of these (No. 4 and 9) are absolutely essential and no fault can be found with them. Articles 5 and 10 have been badly worded and provide a loop hole for investigators, to perform risky trials and continue them when serious harm or death is likely in subjects. The Nuremberg Code has no legal force behind it, and it would be erroneous even to credit it as the framework on which all future codes have been based. Considering that it was prepared by legal luminaries of that time, it appears to be a poor improvisation over the 1931 Guidelines on human experimentation. It has received far more attention than it ever deserved, probably because it was made in a momentous period and that it was authored by Americans. The last word in ethics has not been written; even the latest version of the Declaration of Helsinki needs some changes and will undergo numerous revisions with time. Ethics is an ever evolving subject, 7 and repeated revision of ethical codes is evidence of improving human morals and values. 1. Speer A. Spandau- The secret diaries. USA: MacMillan; 1976. 3. Encyclopedia of Bioethics, Reich WT, editor. 2 nd ed. Appendix p. 2762-3. 4. Vollmann J, Winau R. Informed consent in human experimentation before the Nuremberg code. BMJ 1996;313:1445. 5. Sass HM. Ambiguities In Judging Cruel Human Experimentation: Arbitrary American Responses to German and Japanese Experiments. Eubios J Asian Int Bioeth 2003;102-4. 6. Shuster E. Fifty Years Later: The Significance of the Nuremberg Code. N Engl J Med 1997;337:1436-40.Markman JR, Markman M. Running an ethical trial 60 years after the Nuremberg Code. Lancet Oncol 2007;8:1139-46.